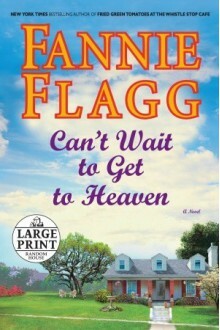 There's something about Fannie Flagg's writing that is comforting. I like how she can write stereotypical characters and not be patronizing. It's not for everyone, but for cozy Southern Americana, it's a safe bet. funny, touching, totally different kind of story. I really never knew what might happen next. I don't even believe in heaven, but this just a fun, playful book that's easy to read and has some fun secrets along the way. A nice feel-good read, if you're not looking for stellar literature.